My favorite thing about homemade salad dressings is that I can customize them and that also means I get to play mad scientist with flavors. But have no fear because there’s a method to my flavor madness. My thought process for this recipe was that roasting carrots brings out lots of flavor. Cumin, one of my most favorite spices, goes great with carrots. 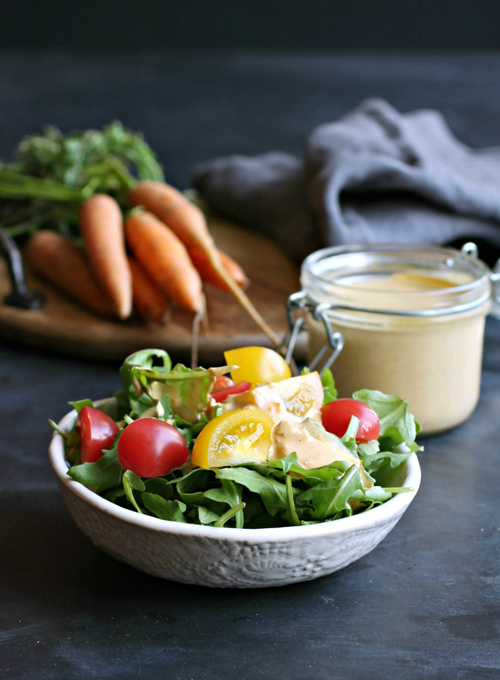 Carrots add a nice flavor to tahini sauce. 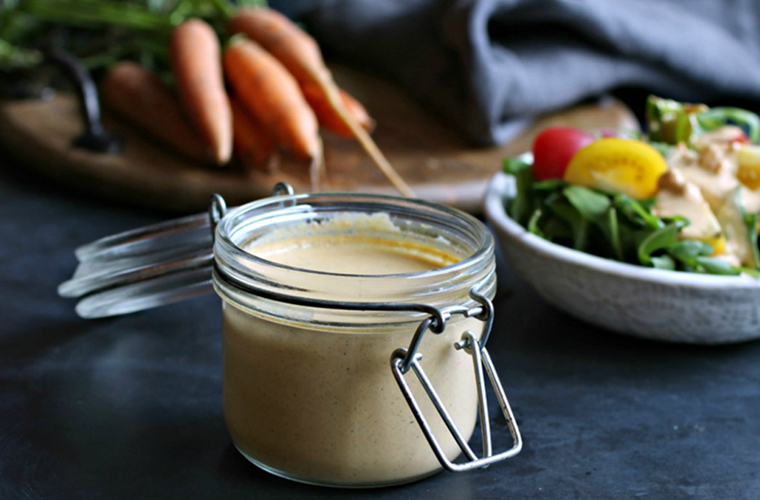 Therefore, cumin roasted carrot tahini should be a winner and it totally is! When you’re buying tahini (usually found in either the ethnic food aisle or with the nut butters at big markets) be sure you’re buying plain sesame paste and not prepared tahini sauce. Making your own is easy, better tasting and, of course, customizable. It’s a simple ratio of equal parts sesame paste and water with the addition of lemon juice and salt to taste. But it can be so much better with a few additional ingredients. Fresh garlic adds flavor and a touch of heat, and Greek yogurt gives it a wonderful creaminess. Carrots, with their natural sweetness, are a wonderful contrast to the nutty flavor of the ground sesame seeds, and cumin brings that quintessential Middle Eastern flavor and aroma. I leave it thick if I’m using it as a dip for vegetables or pita chips and thin it out if I’m serving it as a salad dressing or sauce over roasted vegetables. This versatile sauce is one of my staple recipes and will keep in a lidded jar in the refrigerator for a couple of days. Assuming it lasts that long! Enjoy. Coat the carrots in the olive oil and sprinkle with ¼ teaspoon of the cumin. Place on a baking sheet lined with parchment paper and bake for 20 minutes or until the carrots have softened and lightly browned. Allow to cool. Make the sauce by adding the garlic, roasted carrots, tahini, yogurt, lemon juice and 4 tablespoons of water to the Blendec blender. (Note that I used the Wildside jar.) Puree until smooth and season with salt and pepper to taste. If you want the sauce thinner, add another tablespoon or two of water. Anita is a recipe developer, food photographer and the voice behind the blog, Hungry Couple. Follow her cooking and photography adventures on Facebook, Instagram, Pinterest and Twitter.